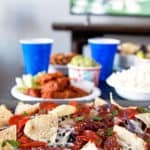 Game Day Pizza Nachos- The most delicious game day recipe when you need something easy and fast! On a baking sheet, add half the bag of chips and spread out. Drizzle with half pizza sauce and 1 ½ cups cheese. Repeat process with remaining chips, pizza sauce, cheese and layer with pepperoni. Bake for 10-15 minutes or until cheese is completely melted and bubbly. If you want to brown cheese a bit more, only leave in for a couple more minutes of chips will burn. Optional: Sprinkle with oregano and parsley and serve hot.